Then I Got To Thinking...: Why do bad things happen to good people? I have asked myself this question so many times and it landed on my lips again today. My sister has been a teacher for 5 years... and her first year teaching, she had an adorable little 4th grade boy with red hair and the sweetest personality. I remember meeting him, and hearing stories about him from my sister who thought he was the cutest thing she'd ever seen. This year, he's is in 9th grade. She says he has turned into the sweetest teenager and has a great heart. My sister had his sibling in her class and has remained close to their family. They are the type of family we all strive to be. Loving & dedicated parents, and overall great people. Yesterday, after school, the 9th grader was hit by a car while riding his bike on his way home from school. He was wearing his helmet. He has sustained very serious & possibly life threatening injuries to his brain and broke several bones in his body. My sister, my family, and the teachers and students who know him are deeply saddened. I've cried a little today just thinking about how horrible this must be to go through. I looked outside at the sunshine today and thought.... his mom and dad are looking at the same sunshine with such terror and grief in their heart. I can't imagine what they are feeling. I feel really sad. I keep thinking of them and wish there was something I could do. Why do bad things happen to such good people? Please send your thoughts & prayers this direction... it's surely a reminder of how fragile life is. Appreciate your family & friends, because we just never know what life has in store for us. heart breaking :( i will be praying for him and his family! Praying for that sweet boy and his family! Oh no, that is terrible, will be hoping and praying for some good news. Oh Tracy! My friend just told me about this as her kids go to that school too. How sad:-( Good thoughts are going their way. He and his family will be in my thoughts and prayers! That is awful! I will definitely pray for that family and hope that the little boy recovers. How horrible! :( Sending prayers your way! So heartbreaking. Praying he is okay! That is sooo incredibly heartbreaking to hear that that happened to that sweet redheaded boy. Thoughts and prayers are with him and his family!! AND your sister! Definitely in my prayers. How sad. That's horrible :( I'll be praying for the family. That is so terrible :( I hope he makes a full and speedy recovery. This is just horrible. I will say a little prayer as well. I hope he is ok. Sending prayers his way. Oh my...how awful! I will keep thinking of him and his family! I have asked myself the same question many, many times. Praying for this boy and his family. Praying for this little boy! I'm so sorry to hear that. I feel so bad for this family. This situation is almost identical to one that my mom faced a couple years ago with a girl that had been in her class. That is so sad and heartbreaking. Hopefully, he'll be able to recover and the person that hit him will be punished. Sending prayers your way. As a teacher myself, I know how attached one can become to their students. I hope that all turns around for the best! 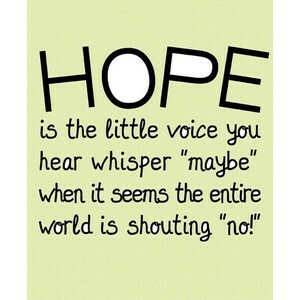 Love the HOPE saying!! Our stay in Kaanapali Maui!